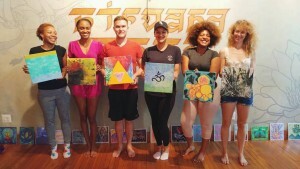 Make & Meditate: A Mindful Art Workshop! You are here: Home / Classes / Make & Meditate: A Mindful Art Workshop! Come find your creative flow with Make & Meditate: A Mindful Art Workshop!January’s theme is “Intention.” We will discover a simple word or phrase that envelops an intention we would like to set for ourselves for 2018, and we will work with our word as we paint. Intuitive painter Tori Price of Luna Leigh Arts will lead this gathering, explaining the benefits of meditation and mindfulness and how they relate to the creative process. After leading a brief meditation, she will share her process of intuitive painting–giving you the space to slow down, open up, and connect with your inner self. This workshop focuses on the present moment and relishing the process of painting, as opposed to focusing on a planned end goal or outcome. You will learn to get out of your head and onto the canvas as you play with paint and create something meaningful for your life’s journey. No experience in meditation or art is required. Everyone is capable of both! All art supplies included. Tori Price has been leading Make & Meditate gathering since June 2016. She studied Psychology at Furman University, and she loves exploring how meditation and the creative process can improve wellbeing. Her passion lies in helping others find inner peace by discovering their creativity. Tori practices mindfulness through her meditative process of intuitive painting. She created Luna Leigh Arts in 2016 to share her colorful, inspirational art with others. She paints both to honor her creativity and to bring the viewer a sense of peace, magic, and wonder. You can view her work on Facebook & Instagram (@lunaleigharts) and on Etsy:LunaLeighArts.Etsy.com.